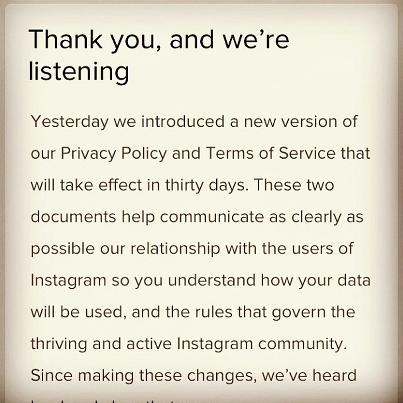 This week, Instagram announced changes to their Terms of Service, to become effective as of 16th January 2013, and after the resulting outcry from its users, you’ve probably heard a little about it already. "Some or all of the Service may be supported by advertising revenue. To help us deliver interesting paid or sponsored content or promotions, you agree that a business or other entity may pay us to display your username, likeness, photos (along with any associated metadata), and/or actions you take, in connection with paid or sponsored content or promotions, without any compensation to you." In a nutshell, Instagram wants to start making money – from your images. And there are plenty who aren’t happy about the social network sponging off their pictures. This is so much the case that Instaport – the site which allows you to export your Instagram library – crashed due to high traffic. But have Instagram users jumped ship too soon? It appears they have. Especially when Instagram reacted with a "Thank you, and we’re listening" post on their blog explaining that the wording of the update wasn't clear, and they’re in fact not selling images, but simply using data – some of which inevitably includes images – to figure out how best to make money from their platform. You can read their full explanation here but can we really be surprised at the update? Recently Instagram was bought out by Facebook for an estimated $1billion, and as we all know, Facebook supports advertising. It’s a business after all and not a free public service. If you really don’t want others stealing using your images – whether Instagram will do this or not - watermark them with your brand name or website. There are a large number of apps to do this with. Any Mark, iWatermark and MyPix are a few good apps that should do the trick. If you post more branded imagery and it is used elsewhere, you may as well consider this free advertising. 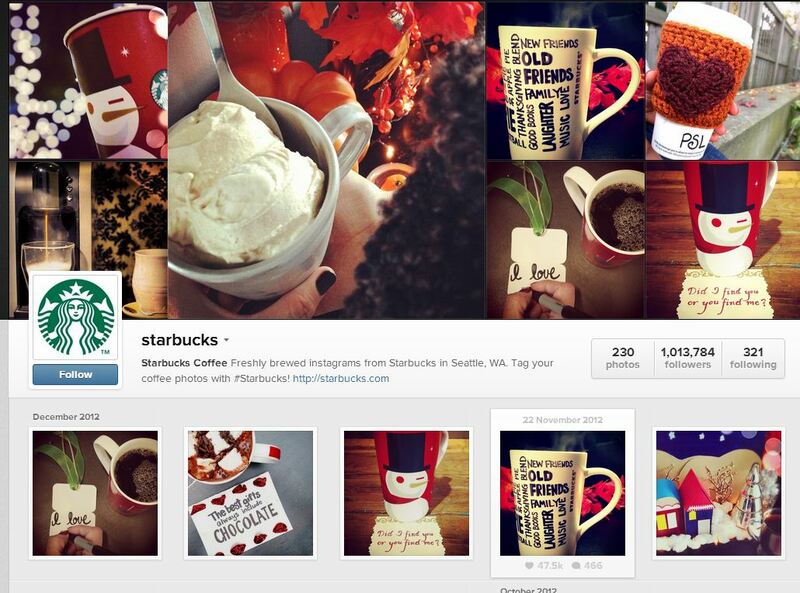 In addition, you could create a community on your Instagram using hashtags. Red Bull does this incredibly well with their #GivesYouWings hashtag. You may find your images elsewhere, but you’re also creating loyal followers and should reap the rewards in the end. If you’re going to stick with Instagram, you might as well ensure that you are making the most of the platform, so drive traffic there. The platform recently launched badges to embed on your website. You can get a badge for your website here. Alternatively, you can download the template and edit it to match your company branding and colours. Not great if you’re a personal user of the platform (although I would argue if you follow a brand on Instagram, there is surely an assumption you are going to see promotional material from time to time) but perhaps an opportunity for businesses looking to gain some exposure in new areas. The fact that adverts can blend seamlessly into a user’s feed could create opportunities for brands to appear more personable, but only if they’re posting the right kind of images – and not invasive “BUY ME NOW!” obvious-type adverts. By showing off products and services in a relatable way, this feature could work incredibly well. Starbucks does this well already, using everything from coffee beans to coffee cups to create interesting and shareable images. Hopefully Instagram will follow a similar model to Facebook when it comes to the costing of this advertising - which is made accessible and affordable for businesses of all sizes, unlike Twitter, who charges tens of thousands of pounds for the possibility of sponsored posts, making it exclusive to those with cash to splash and out of reach for most small to medium enterprises. Generally, Instagram’s changes are simply a reminder to users – whether personal or business – that what you upload is in the public sphere and you can’t control what people do with it. If there is something you don’t want people to see, simply don’t upload it. There are always alternative platforms to consider such as Pinterest, which continues to grow in audience size, and is proving to be a particular success for conversions – or Flickr, where you can determine your copyright preference for your images – but of course this doesn’t necessarily have the sleek interface and growing audience that Instagram boasts (however they do also advertise on the website, but these are clear adverts unlike what Instagram is proposing). If you want to get on board with image-based marketing but aren't sure where to start, get in touch with the Social Media Marketing team.